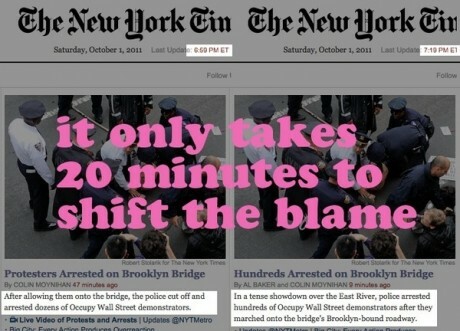 Inititial reports heaped the blame for the confusion on the Brooklyn Bridge this past weekend on the NYPD. Now, the narrative is changing, with the establishment media shifting accusations in the protesters’ direction. More than 700 individuals were detained this weekend in a dramatic mass arrest on the Brooklyn Bridge. Before the march across the bridge began, however, it seemed the police were prepared for an entirely different kind of encounter. Yet the police didn’t appear to make any kind of aggressive move to cut off the protesters before they reached the bridge. In fact, in the various video clips emerging online, the police appear to either be deliberating escorting the protesters across the bridge or passively marching at the front of the crowd. In an interview conducted with Democracy Now! a protester explained that the police appeared to be leading them onto the bridge to “protect them from traffic.” Other accounts have also emerged in which participants claim the police didn’t make a serious effort to stop the protesters from crossing the bridge. The NYPD released video showing a captain with a bullhorn warning the protesters, but it’s unclear when the bullhorn first made its appearance. For example, in this video an officer is clearly warning protesters through a bullhorn, but the timeline of events is unclear. Has the netting already been pulled up behind the activists? Is there even a way for them to retreat at this point? Protesters claim they were led onto the bridge before netting was pulled across the bridge behind them, effectively pinning them in place. It was only then, the activists claim, they were informed they were to be arrested. It’s also a possibility that only the front of the group was aware they were being told to stop, while the middle and back of the crowd obliviously marched onward. But none of the videos that have emerged thus far show the police warning the approaching body—meaning the group moving from the walkway to the road—to stop or risk arrest. Those arrested included New York Times freelance reporter Natasha Lennard. In her report for the Times, Lennard writes that she did not personally witness police leading protesters, but adds, “it seemed our path to Brooklyn would not be impeded.” Lennard doesn’t mention warnings or bullhorns. “I could not hear any police orders,” she writes. When the arrests began, they “seemed random and aggressive.” Indeed, when the Times first reported on the mass arrests, the blame for the chaos was heaped upon the shoulders of the NYPD. “After allowing them onto the bridge, the police cut off and arrested dozens of Occupy Wall Street demonstrators,” the lead paragraph of the initial report by Colin Moynihan reads. Twenty minutes later, the lead paragraph was updated to, “In a tense showdown over the East River, police arrested hundreds of Occupy Wall Street demonstrators after they marched onto the bridge’s Brooklyn-bound roadway.” Now, the blame belongs to the protesters. Once the protesters were cuffed, their detention, transportation and incarceration were all deeply unpleasant experiences. It took nearly three hours for the police to arrest all 700-plus protesters, and that was only the beginning of the ordeal. Lennard details how there was confusion among the police about what to do with all the arrestees. Her own bus was redirected three times from precincts around Lower Manhattan and Midtown as the police tried to find space to hold and process everyone. “One friend, who was taken into a police van, told me his cohort was sent from Crown Heights, Brooklyn, to One Police Plaza. He was not processed until 3 am,” she writes. As they drove around the city, the handcuffed protesters complained of needing the bathroom. Lennard was kept on the bus for three hours before being taken into the Midtown North precinct at 54th Street and Ninth Avenue. (Lennard is not afforded the same degree of protection as a traditional journalist. She was not given a press pass because she’s a freelancer). 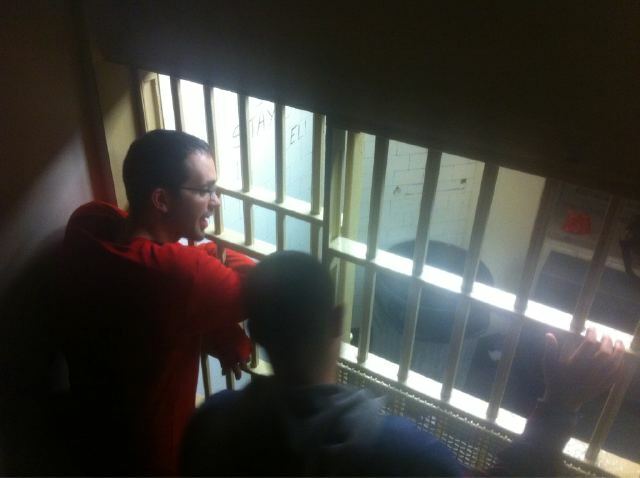 Another protester, Jeff Rae, took some photos on his phone while he was detained in a holding cell. Rae’s cell didn’t have running water, while another nearby cell had a non-working toilet. The Transport Workers Union, which voted last week to support the protesters, announced it plans to go to court today to try to stop the city from forcing bus drivers to transport Wall Street protesters arrested by the NYPD. I spoke with Derick Echevarria, a TWU division chair, about why he personally supported the Occupy Wall Street movement.